This set has everything you need to create quick and easy cards. I made several thank you cards in a very short period of time. Time saving fact #1: These Trimcraft Dies come on their own magnetic sheet, ready to use. No snipping apart required! Just open the package and they're ready to use! Time saving fact #2: I was able to cut all the pieces for each card out at once in one pass through my machine. 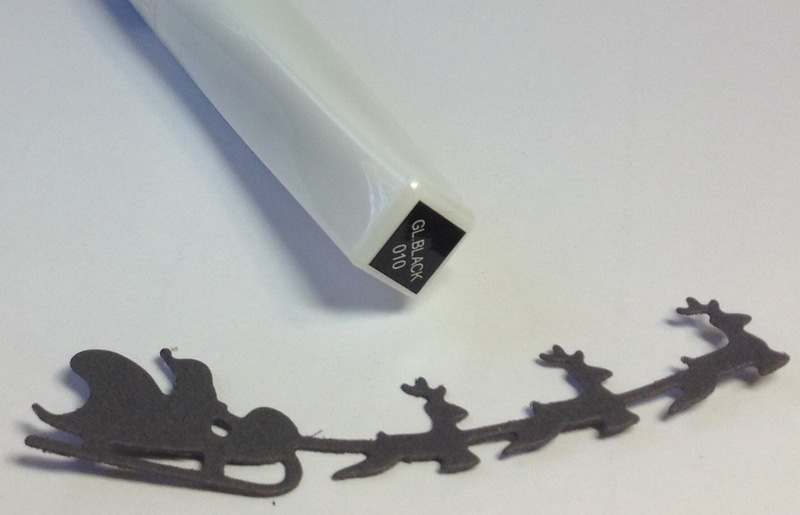 I added black Wink of Stella glitter pen to the reindeer and sleigh die. I really did! I just forgot and took the picture first before adding it. ;0D You can see it the sparkle in the next picture. Time saving fact #3: I assembled the layers onto a square scalloped note card exactly the way the picture on the package suggested so I didn't even have to think it through. I then stamped a thank you sentiment in the space left at the bottom. Time saving fact #4: There is a star die included in the set that cuts several cute tiny stars all at once, that I've added to the night sky. I can see these stars being used as accents on all sorts of cards and they'd be perfect in shaker cards. I can't even express how easy these were to cut, layer and finish. 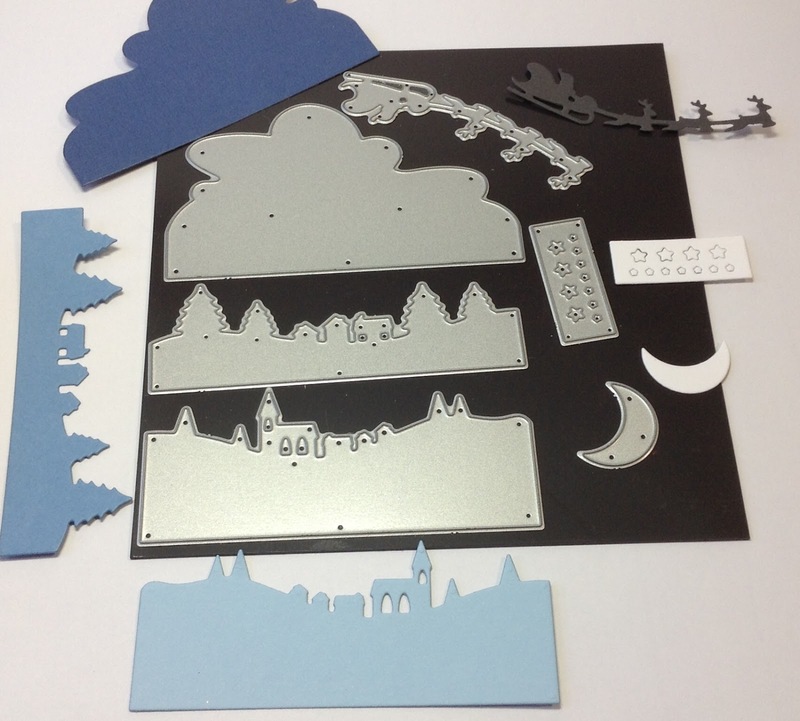 You can find this Build A Scene Night Die Set set and many more from Trimcraft at Dies R Us. And, don't forget to come join in the fun at the Dies R Us Challenge Blog. There's a new challenge offered on the 1st and 15th of each month and one lucky randomly drawn winner will receive a gift voucher prize to the Dies R Us Store. For your convenience, all the Dies R Us links are provided below. I love cards that come together so quickly; this is perfect. Your colors go so well together too. Makes me want to look at other Trimcrafts dies to see what else is available. Thank you for sharing this with us. Fabulous creation Birgit! I too will have to look into these Trimcraft dies a little closer ... thanks for inspiration! 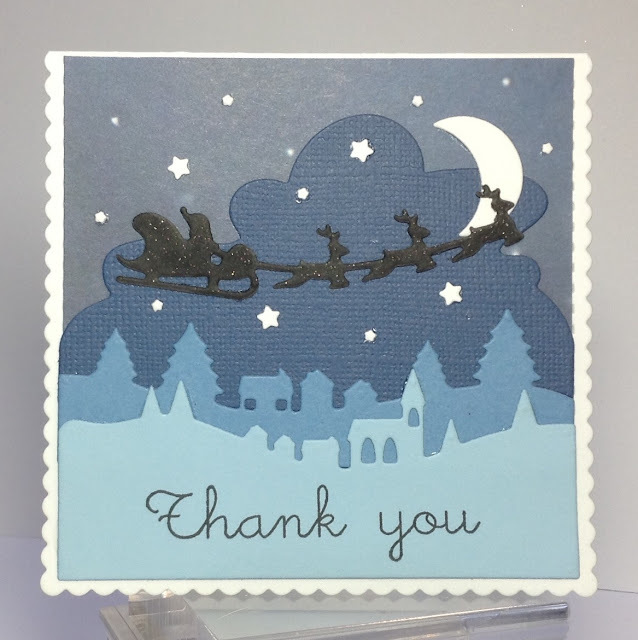 Super card Birgit, I love the scene that these dies create, what a fabulous idea! Thank you for the tips and inspiration! WOW! What an awesome die set, so many perfect pieces! LOVE your original Christmas Thank You card! (I put away all things Christmas--in the craft room that is--and went with some florals) lol This is a wonderful work of art! what a designer you are! this card rocks! you have created a very nice scene!